This soldier, on the way to hospital after being bandaged at Field Dressing Station, shows the helmet which saved his life. 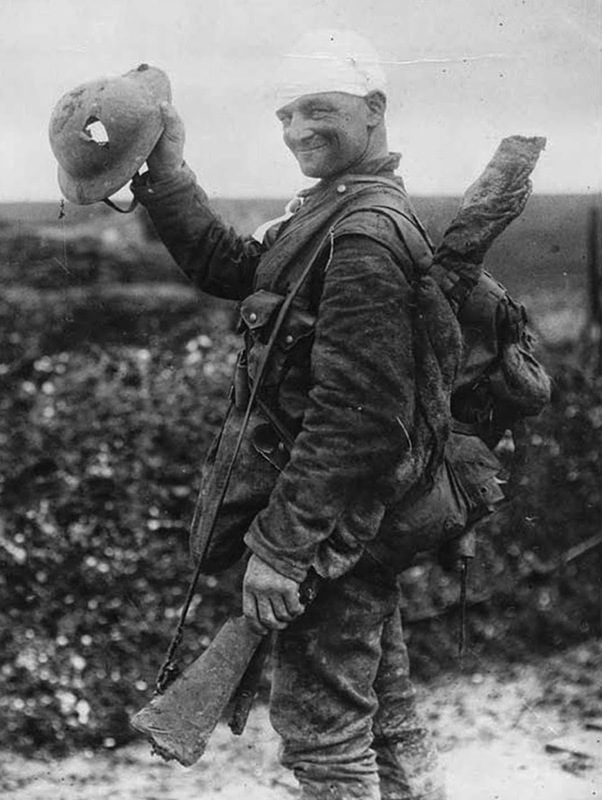 A British soldier with a bandaged head smiles as he shows the cameraman his helmet and the large hole blown straight through it. His smile says it all. Back then the main reason for wearing a helmet wasn’t protection from gunfire, but from shrapnel from exploding artillery shells. Original caption reads: “Saved by shrapnel helmet. This soldier, on the way to hospital after being bandaged at Field Dressing Station, shows the helmet which saved his life”. This photograph would have made ideal propaganda material as its accompanying caption demonstrates. The soldier in the middle of the scene is happy and triumphant. Despite the bandaging on his head, he is still carrying all his equipment and looks ready for action. In 1915, 65% of British casualties were head injuries from artillery fire. During the first couple of years of World War I, none of the combatants provided steel helmets to their troops. Soldiers of most nations went into battle wearing cloth caps that offered no protection from modern weapons. The huge number of lethal head wounds that modern artillery weapons inflicted upon the French Army led them to introduce the first modern steel helmets in the summer of 1915. The first French helmets were bowl-shaped steel “skullcaps” worn under the cloth caps. These rudimentary helmets were soon replaced by the Model 1915 Adrian helmet, designed by August-Louis Adrian. The idea was later adopted by most other combatant nations. Lucky? The entire top of his head is missing! How is he alive?! BaSH PROMPT you need glasses. did you even look at the picture? if the entire top of his head is missing, what is holding up all the bandaging? why is there no blood all over his body?